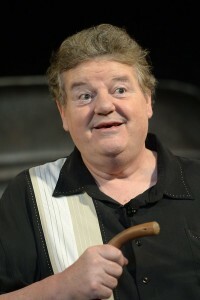 Robbie Coltrane Hospitalized After Flight: Is The ‘Harry Potter’ Star OK? Oh no! The actor who played Hagrid in the ‘Harry Potter’ movies was rushed to a hospital after he got off a plane on Thursday, Jan. 29. Is he okay? Here’s what we know. Robbie Coltrane, 64, was reportedly hospitalized after suffering severe flu-like symptoms, following a flight on Thursday, Jan. 29. The Harry Potter actor’s rep confirmed he fell ill during a British Airways flight from London to Orlando, and since then, he’s been receiving treatment. Paramedic allegedly met Robbie at the gate and raced him to the hospital, a source told TMZ. Robbie, who is famous for playing the lovable Hagrid, was heading to Orlando, home of the Wizarding World of Harry Potter theme park, for a “A Celebration of Harry Potter” event. Dumbledore (Michael Gamdon) was on the same flight as him! It’s not yet clear why Robbie came down with these flu-life symptoms, but according to TMZ, someone on Twitter said the actor was drinking heavily in a London airport lounge before the flight. To say his alleged drinking led to his illness, without proof, wouldn’t be right. No information has been released at this time. Unfortunately, Universal Studios confirmed in a statement to Bay News 9 that Robbie will miss the event in Orlando, but his agent said that he’s expected to recover shortly, according to TIME. Phew! Well, that’s a relief. We’re sure Harry Potter fans will be sad to not see Robbie, but at least we know he’ll be okay! That’s what really matters.